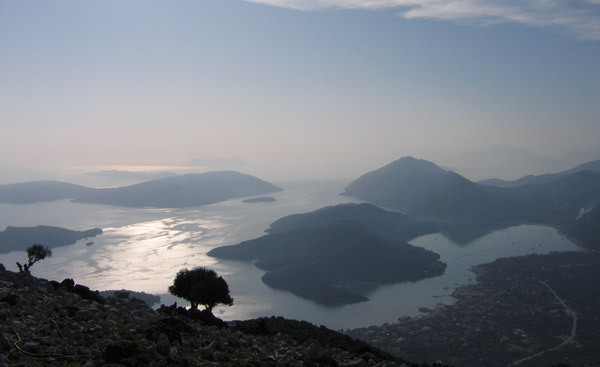 We continue our walking excursion at Lefkada, with the book "Lefkada on foot" by Lida Out. A beautiful long walk crossing through varied and interesting landscapes, calling at traditional villages as well as impressive monasteries. You start in Kolivata, a village hidden in the greenery, pass the monastery of Ag. Georgios and from there you ascend on one of the most beautiful ancient monopatia (footpaths) of Lefkada towards the Skarous woods with its special variety of oak tree. Cows and pigs graze in the woods and it is also very likely that you will come across goats or sheep. After having enjoyed the magnificent views you descend towards the Kokkini Ekklisia monastery, situated in an Arcadian landscape. 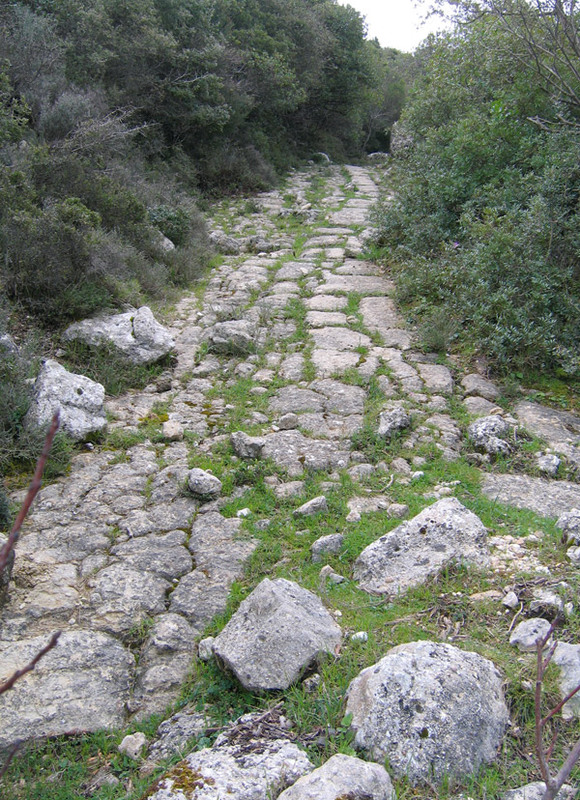 After a short stretch of tarmac you follow a track to Platistoma, a village that has kept its original character. 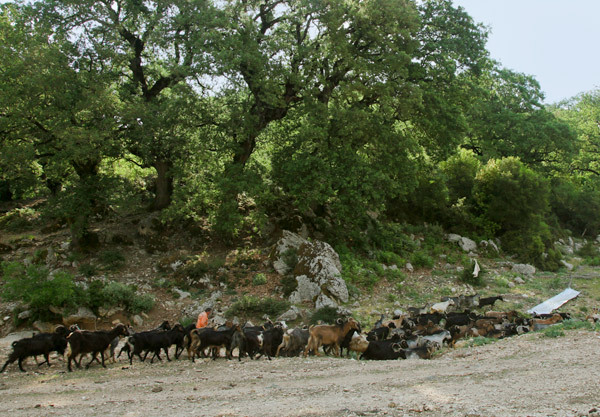 Following field tracks, vineyards and olive groves you eventually reach an eroded river bed, an area of geological interest, just below Kolivata. Finishing again in the village of Kolivata you might want to stop at Maria’s taverna for a well deserved refreshment. Walk no. 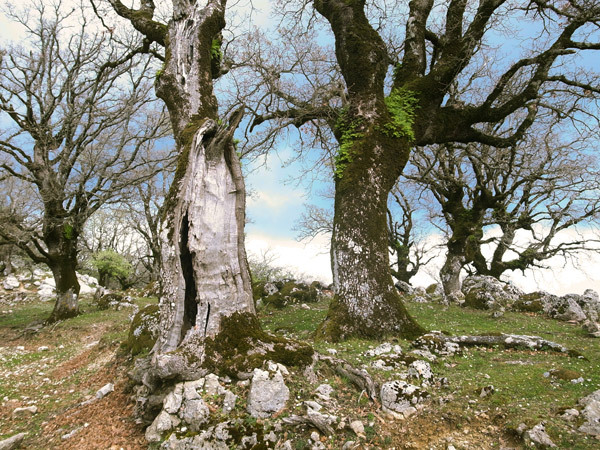 14 is a shorter walk from Kolivata to Skaros Mountain. If you take the car to Kolivata it is advisable to park the car just outside the village, before the turn downhill. You start the walk at the village square in Kolivata, at Maria’s taverna (KR1). To the right of the taverna you will see a track going uphill. Follow this track and turn right immediately. Follow the track that goes left around a house. After 5 minutes you will see the church of Ag. Nikolaos on your left hand side. Follow the wall at the right of the church, keep right on the track and straight after the road turning right you see a monopati (red dot) going uphill at your left. Turn onto this monopati and after 3 minutes you will reach the monastery of Ag. Georgios. The monastery of Ag. 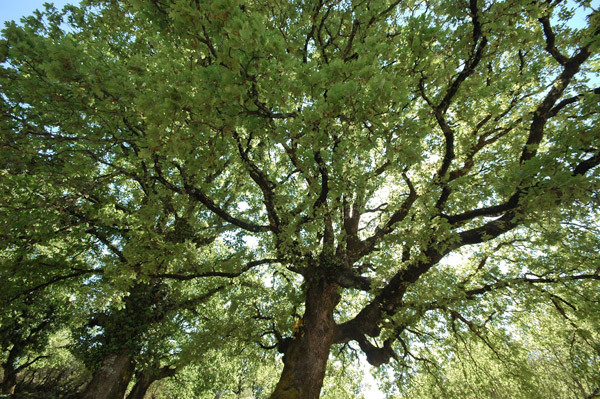 Georgios was founded in 1611 and became by donation owner of the forest of Skarous. In the 18th century the monastery became richer and richer and possessed several churches, farmlands and 900 sheep and goats. In the mid 19th century the monastery went out of use. Continuing from the monopati coming from the village, the monopati goes straight ahead from the left of the monastery (KL1). Follow this beautifully preserved monopati going uphill. After about 5 minutes you pass a gate for animals but you can open it (and close it again). After another 15 minutes the monopati turns into a wider rocky path. After 25 minutes from the monastery you reach an open area with many terraces. Ten minutes further on the path ends in a clearing (KL2). 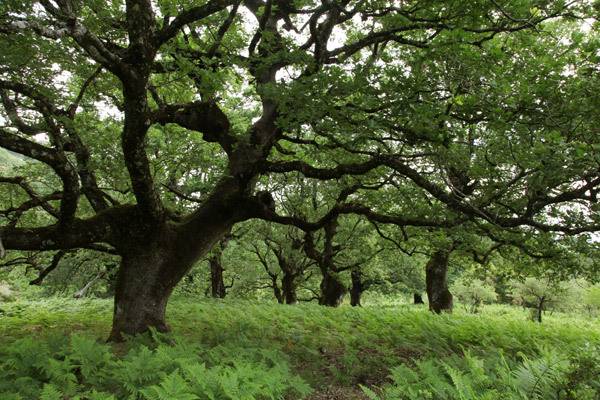 In front of you, you will see the tops of oak trees. Turn right here, the path continues between two small trees. The path then descends to the left and the oak trees are at your left hand side. The path runs between a wall and some shrubs. Keep following this path which becomes rockier. At the end the path is not very clear anymore; you have to go downhill at the right hand side of the sheds. Go straight ahead along the fence and go left until you reach a farm track (KL3). At this point, you have walked for about 50 minutes from the monastery of Ag. Georgios. At the farm track turn right and after 10 minutes you will pass the second shed. Just past the shed the track turns right. After 10 minutes from the second shed there is a turn to the right (KR2). You will later return to this point. Continue for another 15 minutes to enjoy some wonderful views. On the left before the mast you can look onto the east coast of the island (KR3) and the mainland. Just past the mast the view over Lefkada and the surrounding islands is even more impressive (KR4).